Originally published on July 2 as part of our offseason opponent preview series, here's another look at the Troy Trojans ahead of their trip to Memorial Stadium for Saturday's 11 a.m. game. So far, the preview series is holding up nicely. 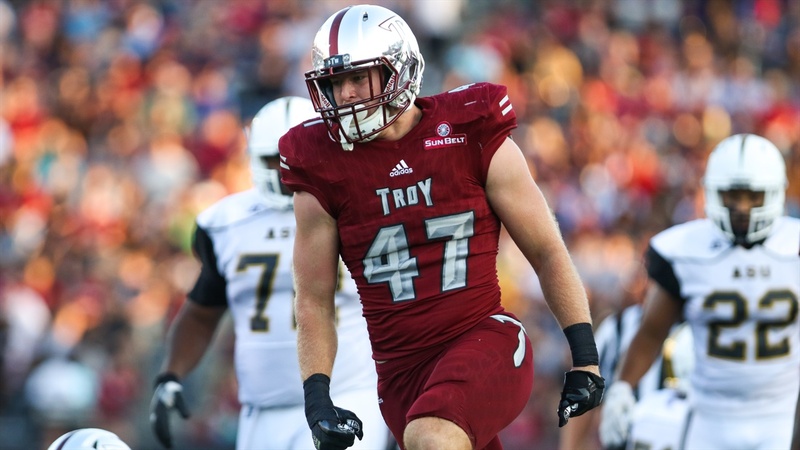 Troy has looked up-and-down on both sides of the ball as it tries to find some footing. Here's some extra context on what the Trojans have done since the season began. Troy (1-1) opened with a 56-20 loss to Boise State then rebounded a week ago with a 59-7 beatdown of the Florida A&M Rattlers. Kaleb Barker beat out Sawyer Smith for the quarterback job and has completed 65 percent of his passes for 351 yards and five touchdowns through two games. He has only tossed one interception. The offense ranks 38th in the country in S&P+ while the defense sits at 114th, though those numbers have been skewed a little by the extremes on the Trojans' schedule. Troy's offense had a 29 percent success rate in Week 1 against a good Boise team and a then a 55 percent success rate in Week 2 against an FCS opponent. Troy's defense gave up a 64.5 percent success rate then a 40 percent rate. That last number is troubling but Troy has been able to produce four turnovers in its first two games. They've been good against the run (2.9 yards per carry against 61 attempts) but have struggled against the pass. Boise's Brett Rypien had a 210.1 rating and a 71 percent completion percentage in Week 1. As coach Scott Frost said Thursday, Nebraska will need to be ready for a fight. The good: Neal Brown is still at Troy. The bad: it probably won’t be for much longer, as high-performing G5 coaches don’t stay high-performing G5 coaches for very long. The good: after a 4-8 season to begin Brown’s tenure, the Trojans have enjoyed a 10-3 and, most recently, an 11-2 record. The bad: Troy might be in for a tougher time in 2018. The Horse’s grand entrance at the gates of national attention last year came by way of a 24-21 win over a then-ranked LSU squad in Death Valley. It was the first time the Tigers had lost to a non-SEC school at home since 2000. If you just checked in for that game, you were missing the bigger picture. Sure, the upset was one of the crowning achievements for last year’s squad, but that team also set a program record for wins in a season, shared a split conference title with Arkansas State (its first since 2010) and won a bowl game for the second year in a row. There are goods and bads to be discussed with the Trojans as it relates to 2018. Obviously, Brown running it back for another year is as good as it gets but let’s start with the bad, the reason ESPN’s Football Power Index has Troy at 7-5 this season, ranked 97th in the country. Everything begins and ends with the defense. Up front, the Trojan defense suffocated opponents’ running games in 2017, ending the season ranked third in the country in rushing yards per play (3.74), fifth in stuff rate (26.8 percent of all runs were stopped at or behind the line of scrimmage) and ninth in yards per point (18.23). In order to score, offenses needed to grind and most of the time they didn’t; Troy finished 11th in the country in scoring defense. Now, I know what you’re thinking. “Derek, those are all good things, why are they in the bad column? ?” Because Troy would be hard-pressed to find that same kind of production again. Why? Again, it starts up front. The top three guys from the line are gone. More specifically, 22.5 tackles for loss and 13 sacks combined between defensive end Seth Calloway and defensive tackles Jamal Stadom and Baron Poole II are gone. That kind of production is just hard to replace (unless you’re a team like Alabama) and that’s not even taking into effect the value of experience. Depth could be an issue. So much so that Brown nabbed three JUCO transfers just on the defensive line to try and bolster things. Flipping over to the offensive side of the ball, there’s a similar production void that formed after last year’s New Orleans Bowl victory. Brandon Silvers, a four-year starter at quarterback and career 64 percent passer, is gone after throwing for 10,684 yards and 71 career touchdowns. Jordan Chunn takes his 3,124 yards and 47 rushing touchdowns out the door with him. (Troy also lost its second-leading rusher to graduation.) And all-conference left tackle Steven Rowzee has graduated. There are two back-ups battling for the starting quarterback job — 2016’s Sawyer Smith and 2017’s Kaleb Barker — and that’s a good thing for a coach to know he has guys that already know the system. They just lack the experience running it; Barker, a junior, has 30 career pass attempts while Smith, a redshirt sophomore, has 25. Big plays help young quarterbacks and this offense wasn't known for producing big plays a season ago — 74th in explosive play percentage. Bucking that trend now feels like a risky bet. Hello, Hunter. Hello, Tron. Hello, Blace. Honestly, the Troy defense might have the best names in football. And they’re pretty good at playing too. Hunter Reese, a breakout candidate at the Bandit position in the Trojan defense, had 13.5 tackles for loss, six sacks, an interception and a fumble recovery last year. Tron Folsom, the team’s leading tackler a season ago, returns to anchor the linebackers. Blace Brown, a corner who walked on to the team in 2014 and played three games on special teams before redshirting in 2015, has led all players in the Sun Belt over the last two seasons in interceptions (11) and earned first-team All-Sun Belt honors in 2017. While proficiency in metrics like stuff rate and run YPP from last year might not carry over in 2018, some of the style-indicating numbers will and the good news for Troy is it still has the personnel to keep on keeping on. Troy ranked 16th in the country in defensive explosive play percentage. Could that have been helped by the front line plugging holes? Sure, but the back-end had the eighth-best havoc rate in the country and the majority of those players return. (Five linebackers and seven defensive backs who made at least 12 tackles last year are all back.) They also added a talented former blue-chip safety in Oklahoma transfer Will Sunderland. This defense was also the No. 1 defense in the country in points per trip inside the 40 and ninth in yards per point. Replacing talent up front will be a task, but this will be the best defense any of the Trojan’s nonconference opponents will see. Troy’s offense probably takes a hit in efficiency but the side isn’t lacking for potential. Senior wideouts Deondre Douglas and Damion Willis — 90 catches, 1,248 yards, eight touchdowns last year — return as the aerial threats. There’s a Louisville transfer taking over in the slot. There’s one of the top JUCO running backs in the country last season joining a running back room that sports a young tailback in Jamarius Henderson, who just so happened to average 7.9 yards per carry last year. And losing Rowzee hurts but three starters return up front. So while the double-digit win streak of the last two years might very well be coming to a close as Troy tries to reload in a conference that for the most part got better, the good news is there will still be plenty of excitement in store for 2018.